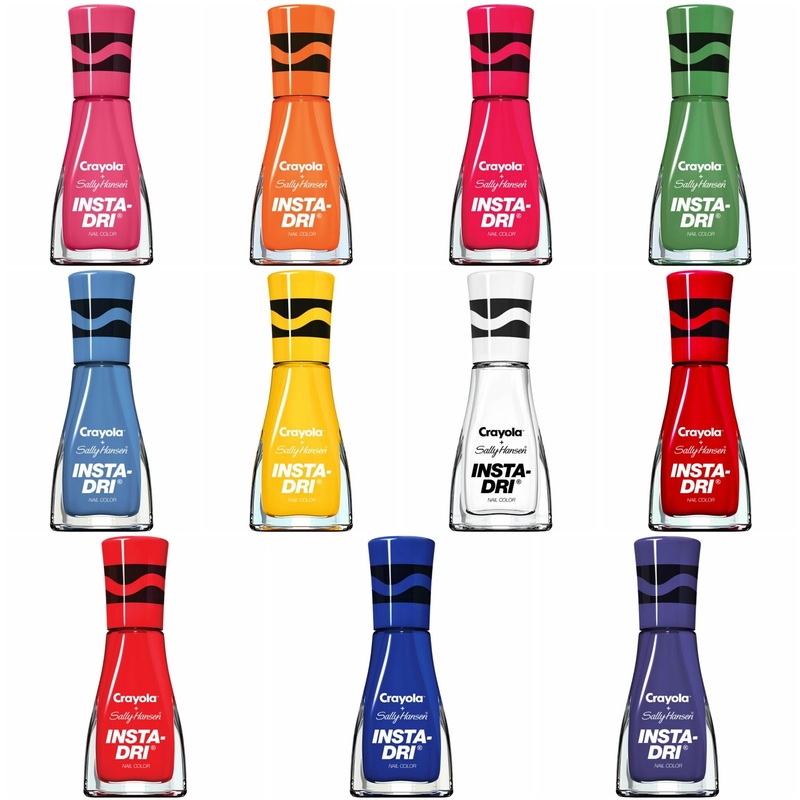 Sally Hansen X Crayola Collaboration- COLOR yourself happy! GO BACK TO SCHOOL IN STYLE: INTRODUCING THE NEW SALLY HANSEN + CRAYOLA INSTA-DRI COLLECTION! Wild Strawberry - Ripe and ravishing, this primary red crème shade is a classic. Sunset Orange - As bold as it is beautiful, this hue conjures memories of blissful beachy evenings. Carnation Pink - Everything’s coming up carnations in this vivid, pretty pink. Dandelion - Picked right from a sprawling field, this sunny saturated yellow is a force of nature. Granny Smith Apple - Take it to the tart side in this vivaciously verdant polish. Cerulean - Rock this hue, it’s a go-to blue for back to school. Vivid Violet - Cultivate the feeling of floral fancy in this purple shade that elevates any first-day-of-school outfit. White - No better way to kick off the year than with a blank slate. Be crisper than a white board with this pristine white. Razzmatazz - It’s your time to shine bright and be a dazzling star with this raspberry hue. Scarlet - Show off your summer tan with this red hot mani. Denim - Casually cool, this jean-ius indigo hue goes with everything. Purple Heart - Be the Queen Bee in this courageously colorful purple.